Sub: Extension of retirement age of Doctors- Travel Entitlements reg. In terms of Board's letter No. 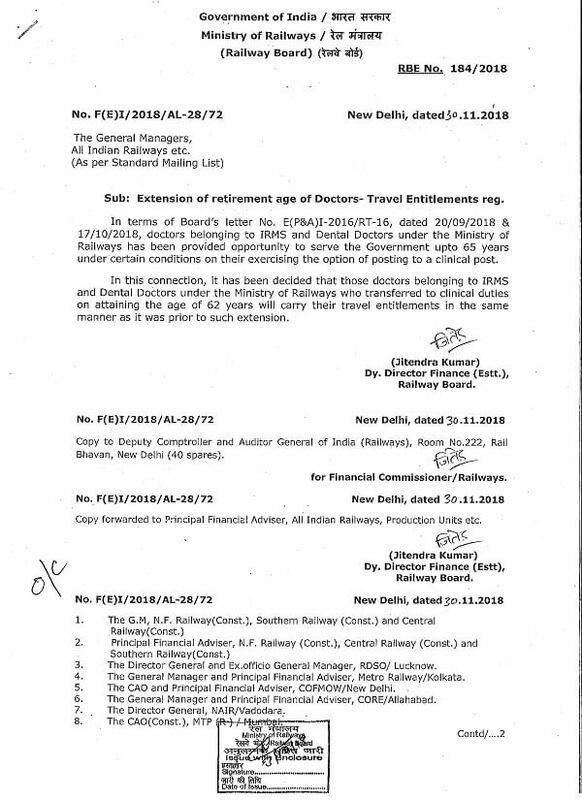 E(P&A)1-2016/RT~16, dated 20/09/2018 & 17/10/2018, doctors belonging to IRMS and Dental Doctors-under the Ministry of Railways has been provided opportunity to serve the Government upto 65 years under certain conditions on their exercising the option of posting to a clinical post. Copy to Deputy Comptroller and Auditor General of India (Railways), Room No.222, Rail Bhavan, New Delhi (40 spares). New Delhi, dated 30 11.2018. Copy forwarded to Principal Financial Adviser, All Indian Railways, Production Units etc. 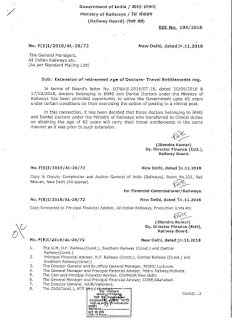 Ministry of Railways has been provided opportunity to serve upto 65 years under certain conditions on their exercising the option of posting to a clinical post, travel entitlements in the same manner as it was prior to such extension.